I would like to begin with a prayer which I borrowed from others who have come before us. Lord, thank you for walking with us through the seasons of our lives. And for autumn days as leaves fall to seed new growth. And all those who have come before us. For the winter, when we are held safe in your arms through the darkness. For the hope of spring, as we are filled with new promise and life. When I quieted my mind to find words for today’s sermon, I noticed that today is the first Sunday of advent. My feelings about Advent have radically changed since I was a boy. I grew up in a church which did not really put emphasis on the advent rituals so I didn’t pay it much attention. The traditions around Advent have clearly evolved over the years. Since the time of Saint Bernard of Clairvaux, who lived in the eleventh century, Christians have spoken of the three comings of Christ; “ in the flesh in Bethlehem, in our hearts daily, and in glory at the end of time.” This description triggered my imagination. The coming of Christ is what we are preparing for during Advent. It is the first Sunday in Advent and you have heard the gospel reading for today. Usually I enjoy creating my sermons around the gospel reading for the week I will be preaching. But as I read this gospel about “people fainting from terror, apprehensive of what is going on the world, nations in anguish and perplexity at the roaring and tossing of the sea,” I thought to myself, what will it take to make sense of this reading? The reading contains a lot of predictions about things that are going to happen at the end. “At that time they will see the Son of Man coming in a cloud with power and great glory.” Hmm I wondered why the lectionary planners would have us read this Luke passage during the first week of advent? And where is the power of the Son of Man today? I can meditate, pray, listen and know God directly. I can use the writings in scripture as triggers for my own awakening. I’m betting that you also have intuitive hits, dreams, and insights that come to you in the middle of the night like spiritual batons which are handed to us from the holy. I’m thinking that these spiritual batons are being passed out constantly. Bear with me as I develop my own metaphor of a spiritual baton. In a relay race there are teams, but the individuals run separately, one at a time. The person running has a baton which is passed on to the next person who then runs with it until it is passed on again and again. Imagine spiritual insights like batons being handed off from person to person over time just like Saint Bernard of Clairvaux who triggered my imagination when he said, “Advent is the coming of Christ who lives in our hearts daily.” I would like to share one other historical spiritual baton, then conclude with some recent examples. Saint Teresa of Avila, more than four hundred years ago, accepted the challenge of helping her fellow nuns believe that they had the power to connect with God. She was very frustrated with passing along this knowledge. Finally she received a dream which contained a metaphor of the soul as looking like an interior castle that contains many mansions and over one hundred rooms. In each room one can have a different connection with God. The first step is to enter the castle which is no small task. The castle has a moat around it. One must go over a drawbridge to reach the castle. To cross over one must fight their way through the swamp while trying desperately to stay on the path. The walls around the Castle prevent one from entry. Teresa authored The Interior Castle, which is her offering of a spiritual baton. For me personally, this has been a transforming spiritual baton. Travelling from room to room with the Holy gives me a safe place to talk with my spiritual companion. Bill Wilson, founder of Alcoholics Anonymous, offered spiritual batons as well. He helped identify and explain the twelve steps of recovery which provide stepping stones for experiencing a spiritual awakening. At one point he wrote “If more gifts are to be received, our awakening has to go on. As it does go on, we find that bit by bit we can discard the old life—the one that did not work—for a new life that can and does work under any conditions whatever.” We know the impact AA has had on the lives of millions of people who received the baton and ran with it, passing it on to still others. Closer to home let us think about the spiritual batons that have been handed to us from Gordon Cosby including The Journey Inward and the Journey Outward, Mission groups, call and so on leading us to Seekers Church whose members caught the baton. Spiritual companionship also has been an ongoing part of Seekers Church. Recently I joined a group of Seekers to learn about and discuss the topic of spiritual Companionship. There was transforming energy around this topic. Although spiritual companionship is a feature of a mission group, not everyone is in a mission group. We looked at each other. Whose job is it,ie., stewards, SLT, mission group members? By the end of the discussion we realized we can each take what we are experiencing and share it with others. We can each carry this baton. Borg invites us “to move from secondhand religion to firsthand religion. Secondhand religion is a way of being religious based on believing what one has heard from others. Firsthand religion is based on living in accord with what one has heard directly from the Spirit by way of prayer and meditation as well as contemplation of scripture. Firsthand religion is central to the emerging paradigm of Christian living. We are invited to seek a transformation and to experience God directly, Jesus living in our hearts daily. 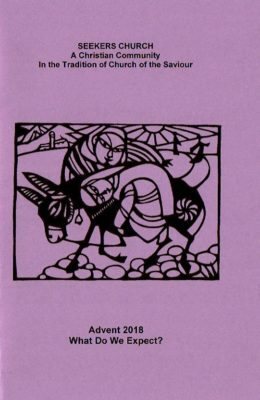 2018 Advent Liturgy : What Do We Expect? David reflects on God’s call on him to seek justice and health for America’s children, and his commitment to support our School of Christian Living.